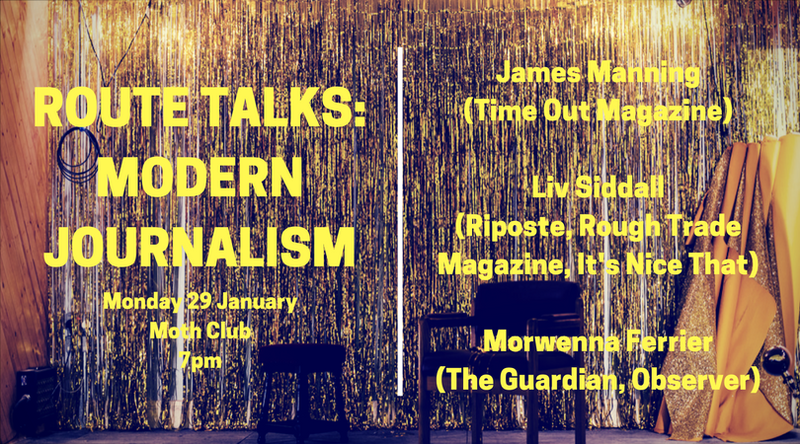 Next week, we here at Route will be hosting a panel discussion on the modern world of journalism at Moth Club featuring some of the capital's leading writers and editors working across the fields of music, art, fashion and lifestyle. James Manning (Time Out Magazine), Liv Siddall (Riposte and former Rough Trade Magazine and It's Nice That) and Morwenna Ferrier will be on hand to share stories from their current careers so far, offer practical advice about how to pitch, how to get paid, discussing the challengers staff writers and freelancers face and giving a real insight into how the industry works at a modern publication today. As a quick preview, we asked our guests to answer a few questions about their first jobs and writers block tips. There are a few tickets left for the event, available here. James Manning is the City Life editor at Time Out, responsible for commissioning, editing and writing stories about London life for print and online. He also writes about music, nightlife, food, bars, art and culture. What was your first writing Job? My first writing job was actually at Time Out – I came as work experience then got a regular freelance gig that set me up in turn for a staff job. Before that though I'd done shedloads of writing for my uni newspaper, and before that my own music blog that I started when I was 17, so I had quite a lot of work and practice to show even though I wasn't getting paid for it. Which of your own articles are you most proud of and why? I'm really proud of the Bowie obituary I wrote in the week of his death. The editor of the magazine bumped the cover that had been planned, and I spent two or three days leafing through old interviews in archive copies of Time Out, listening to his albums and writing a six-page piece that told his life story through Time Out interviews and features – as well as helping to choose the pictures and layouts. I'm a huge fan, obviously, so it's really amazing to be able to say that I was the person who wrote Time Out's official obit/tribute feature. That's never going to happen again. It was also my first ever cover feature, so that was great too. Do you have a journalistic or literary idol? I think idolising journalists probably isn't a good idea, but I'm a big admirer of Simon Reynolds as a music writer – he was really influential on me as a teenager. Amelia Tait at the New Statesman is an amazing writer on digital culture – I wouldn't say I idolise her because that'd be weird, but I'm definitely jealous of her ability to find weird stories from the internet that I've never heard of. There are also loads of great people at Time Out who are really gifted writers as well as experts in their field. More generally I'd say anyone who wants to write good journalism should read George Orwell's 'Politics and the English Language'. What were some of your favourite publications to read in 2017? I'm actually a bit crap at reading other people's publications and keeping up with the wider world of journalism. I love the New Statesman and City Metric, I read pretty much every issue of Private Eye, and I sometimes steal my girlfriend's copies of the New Yorker when she's finished. I read stuff in all the usual online places – Vice and Broadly, the New York Times, Guardian long reads, The Quietus for music stuff, lots of local London news sites – though I try not to be glued to my phone when I'm not at work. I actually prefer podcasts to a lot of online writing. What is your go-to trick for overcoming writers block? I don't think I've ever really experienced full-on writers' block, but like everyone I do get stuck a lot. I think the best thing to do is just to keep writing – even if what you end up writing is really crap, it's something for you to go back and remodel. If I'm totally unable to get past a chunk of writing, I skip it and then go back – usually by the time I've finished the next bit, my brain has got out of whatever rut it was in. Also, find a programme with minimal clutter to write on – I use TextEdit on my laptop, because there's not much in the way of formatting to distract you from the actual words. Liv Siddall is a writer, editor and content producer who works across print, digital and radio. Formerly the Editor of Rough Trade Magazine and host of Rough Trade Radio, and also Online Editor and Features Editor at It’s Nice That. Liv is now freelance and a contributing editor of Riposte Magazine. Previously she has written for It’s Nice That, Riposte, Printed Pages, AnOther, Dazed, The British Journal of Photography, Mr Porter Journal, Grafik, Freunde Von Freunde, Amuseum, Beyond Magazine, St James Correspondent, The Debrief, Gymclass, Rookie, SomeSuch Stories and many more. She also records podcasts, give lectures and host events and panel discussions. I think it was when I was about 20 and I joined It's Nice That as an intern. I was told to just find cool stuff and write about why it's good. Dream job to be honest! I just wrote an article about farting (a farticle) for the latest issue of Riposte Magazine which I believe is my magnum opus. I've always loved The New Yorker, but I think in 2017 it became something different, in a good way. It's now like the rebel rag. It's using humour, wit, creativity and intelligence to counteract the evil forces in this world. I haven't got one! It's terrible. Although I am getting better at the idea that if you're not in the mood to work, it's okay not to work. Morwenna Ferrier is the assistant editor, at the Guardian fashion online. She is a former Contributing Editor to OFM and writes for the Observer New Review, Observer News and Guardian Guide as well as the Telegraph, Independent and Grazia. My first unpaid writing job was for a music magazine in Leeds called Sandman. My friend and I fell out with the editor of the student paper over something involving The Cribs I think? It was mostly a good way to see gigs for free. 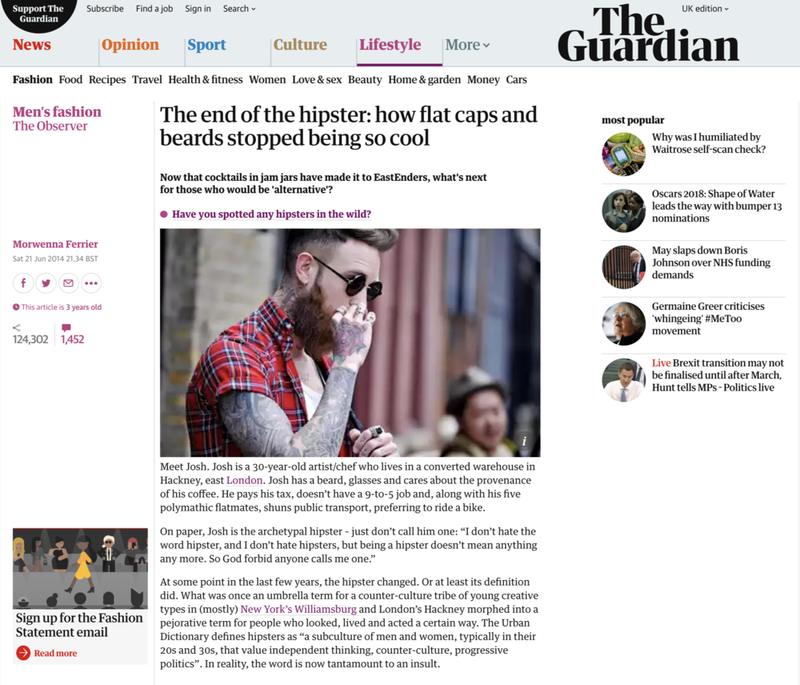 My first paid writing job was actually for the Guardian, which is mad. I lived in Italy for a while and decided to pitch a food story about a famous chocolate drink made by one lady in one cafe in Turin. The Guardian was the only publication to reply to my pitch. God I don't know. I am proud of a few things I guess. Absolutely not everything though. So. That Guardian one in 2006. My mum got it framed and it's hanging in the downstairs loo. I got a front page splash at the Telegraph after Alan Bennett told me shutting libraries was tantamount to child abuse, that was cool given I didn't have an NCTJ. I wrote a fun piece about Banksy buying my mum's house for Vice which I repost every now and then. At the Guardian, there are two ones I remember. One was a few years ago in which I killed the hipster. I know everyone has killed the hipster but this was before everyone else was killing it. It got over 2m hits. I'm proud because that essentially got me a staff job. And then my interview with Zlatan Ibrahimovic because that was just about the best commission. Also Tad Friend. Olivia Nuzzi is pretty impressive. Anthony Lane too. Monica Heisey is about 11 and very good. Obviously Joan Didion because I'm a woman. The Happy Reader. Gentlewoman. McSweeny's. Both quite obvious. The New Yorker obviously. The FT mag is always good. Always by stopping whatever version you're on and starting again from scratch. I also pretend my word length is 400w even if it's not. That usually makes you get to the point quickly and then the rest flows.